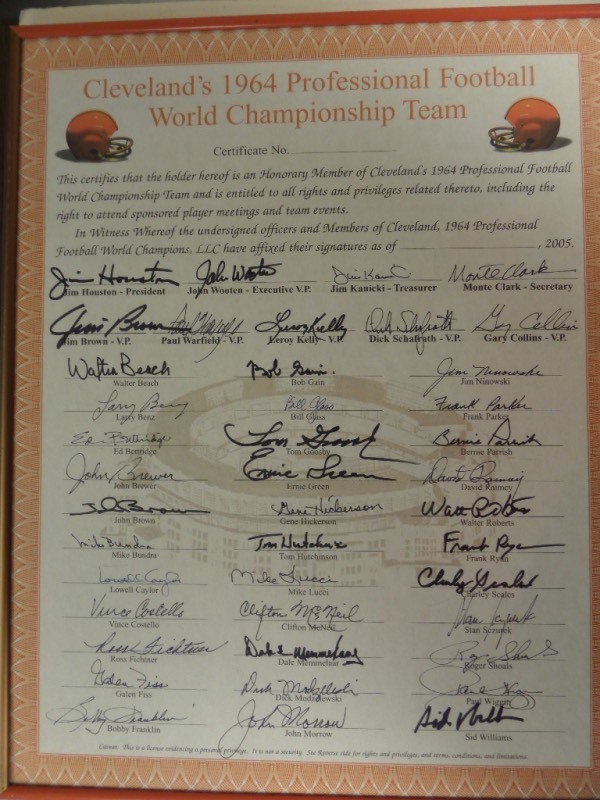 Coach's Corner - 1964 Cleve Browns team signed/framed team sheet. Go Back to Lot List 1964 Cleve Browns team signed/framed team sheet. This custom sheet is large, well done, and issued at a team reunion event in 2005. It is about 16x20 after framing, comes hand signed by everyone, including Jim Brown, Leroy Kelly, Paul Warfield, Gene Hickerson, Frank Ryan and plenty more. It grades a clean bold 10, comes with our own famous lifetime guarantee, an sold out at mid-hundreds years ago. If your a fan of the team, BUY IT NOW!! !